Many companies in today’s economy are controlling expenses and reaping high returns by retaining Baby Boomer at their jobs. According to U.S. Government data, common workplace hazards –among workers aged 55 through 64 in U.S. private-sector industry declined in recent years to about 42 per 10,000 full-time workers in 2010 from 48 in 2006. Companies could hire young workers to replace older ones, but many jobs require years of on-the-job training. 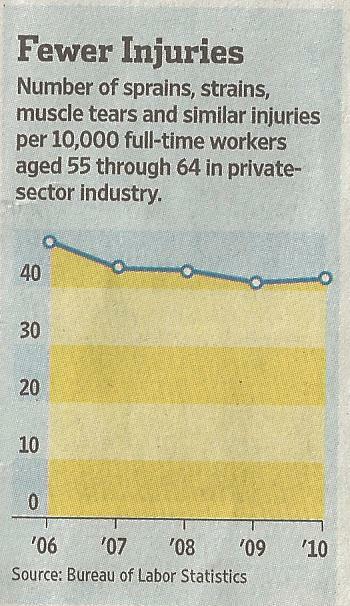 Companies also tend to value older workers because they are less likely to job hop according to the Wall Street Journal. At Sierra, our focus is on redesigning the work area or station to reduce sprains, strains and similar musculoskeletal injuries which lower workers’ compensation costs and keep these Boomers on the job. These efforts are paying off especially when a lot of solutions can be very low cost. By having us review a Boomers work area or station early, we can attend to the issues before they get to be a large, expensive and career ending injury. Many of the adjustments can reduce the wear and tear on Boomers while improving their productivity. Stretching and individualized exercise programs, along with better lighting, less twisting and bending are just a few options for keeping employee fit to work for many years to come. If your company is faced with older workers who need to keep fit on their jobs call us! We can help.